So that's what happened to Bobby Rotenberg. The Globe and Mail published a story on Saturday by Kate Hammer concerning the about-to-be-published mystery novel by Toronto lawyer (now Robert) Rotenberg. But, as the story noted, he once founded T.O. magazine, which is sometimes fondly remembered for having been a feisty (if, ultimately, unsuccessful) attempt to give Toronto a different kind of city magazine. He managed to keep it going for seven years (1984 -91). At the age of 37, after spending most of his adult life trying to avoid becoming a lawyer, he finally began practising criminal law. But he made time for writing. That meant waking up at 5 a.m. for an hour of writing. Or, as his children grew older, stealing a couple of hours to write while they attended a birthday party, or an hour during hockey practice. Rotenberg, went on to have an unusual criminal law career in Toronto, defending what the writer called "some of the city's most unusual clients". Now, Rotenberg is publishing Old City Hall (Simon and Schuster), which is being launched in hardcover on Tuesday. It takes Toronto as its canvas and takes advantage of Rotenberg's legal experiences with murder and mayhem of various sorts. "I wasn't trying to write about Toronto as the world's most multicultural city or the greatest city. Just Toronto, warts and all," Mr. Rotenberg said. "And the warts are much more interesting than the other stuff." Back in 1991, I was thirty-seven years old, my wife was pregnant with our first child and I was broke. I'd been called to the bar ten years earlier and spent a decade doing everything I could to escape the work-a-day fate of practicing law. Magazine editor, radio show producer, film executive. I lived in London, Paris and New York. But now here I was, walking into Scarborough Provincial Court in suburban Toronto, briefcase and Criminal Code of Canada in hand. Nothing like a mortgage to concentrate the mind. I built my law practice and secretly started writing. I finished my first book in 2001. It was a thriller and I made damn sure it had no lawyers, no courtroom scenes. Then I got an agent in New York. The day she told me she there were no buyers, I started Old City Hall, named after the central criminal court in downtown Toronto. Stuck a dead body in chapter one. It had taken me a decade to own up to the cliché "write what you know." Perhaps, a la T. S. Eliot, I'd arrived at the place I started and knew it for the first time. Where's the magazine tax credit in Ontario? Am I alone in wondering how it can be justified for the Ontario government to make enhanced tax credits permanent for the film industry when the magazine industry in the province is the only cultural industry without a tax credit at all? -- Former editor of The Walrus, Ken Alexander, quoted in a Globe and Mail profile by James Adams about life after Alexander left the magazine last June. [This post has been updated]A Facebook group called the Coalition to Keep Canadian Heritage Support for Literary and Arts Magazines has been created to try and reverse a decision to discontinue funding for magazines under 5,000 annual circulation.The Facebook group was started by John Barton, the editor of The Malahat Review, Jon Fiorentino, editor of Matrix, Anita Lahey, editor of ARC Poetry magazine and Andris Taskans, editor of Prairie Fire. It has already had 773 1,100 members signed up. With a few exceptions, the circulation of virtually every Canadian literary and arts magazine, large and small, is below 5000. We have to make sure this possibility does not become an actuality, for if it does, as April 1, 2010, these important and praiseworthy magazines will no longer qualify for funding that they have been receiving for years from the CMF and PAP despite the excellent work that they undertake for the readers and writers across Canada (and around the world)! The Coalition to Keep Canadian Heritage Support for Literary and Arts Magazine feels strongly that to render these magazines ineligible for this support would be unjust. To quote Andris Taskans, editor of Prairie Fire, to do so would be "a slap in the face"---not only to the magazines themselves but to the many writers that they publish, many of whom began illustrious, international careers in these seminal if modest publcations. To do so would also be a "slap in the face" to the ordinary (and extraordinary) Canadians who read them. By definition little magazines are have little audiences but they do mighty deeds. Their small circulation is not a sign of failure, it is a proud tradition started by some of the most influential and yet most exclusive magazines in history--Athenaeum, Blast, Poetry, McGill Fortnightly Review, Contemporary Verse, Contact, blewointment, Tish, Brick--magazines that started the publishing careers of most of the giants of English and Canadian literature. I don't think [Heritage Minister]James Moore set out to extinguish this glorious tradition. He just doesn't know what he has done because he did NOT do his homework. Now we must do it for him. Interesting that JPG magazine, at death's door not too long ago, has been bought by a group of investors ande will carry on. According to a post on Techcrunch, the innovative photography magazine has been revived. 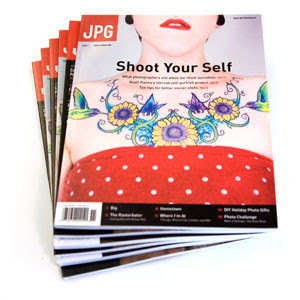 JPG launched in late 2006 with the novel idea of cutting back on publishing costs by accepting user-submitted photos and relying partially on the community to edit the magazine. But despite reaching near-profitability, the periodical announced that it was shutting down on January 2nd when its parent company 8020 Media ran out of money. The deadline for entry the Western Magazine Awards has been extended to Friday, March 6 at 9 p.m.
Flare, one of Canada's most important fashion and beauty magazines, is celebrating its 30th anniversary this year. First published as Miss Chatelaine in 1964, the Rogers Media title became Flare in 1979. It now has about 1.5 million readers, according to the most recent PMB research. "As Canada's leading fashion magazine for the past 30 years, Flare has launched the careers of the country's most sought-after designers, photographers, models and editors," says Lisa Tant, editor-in-chief, in a release. "At home and abroad, Flare is recognized not only as Canada's style authority but a world-class destination for the best the fashion industry has to offer." The anniversary celebrations will include a special edition and soon-to-be-announced gala. When a newspaper dies, you don't get a comprehensive periodical to fill the void. You get an informational vacant lot into which passers-by can throw their junk. [This post has been updated]The Canada Council for the Arts has apparently quietly dropped the so-called "Lola clause" from its guidelines that has for several years allowed controlled circulation arts and literary magazines to qualify for funding based, in part, on their advertising support. Previously, and apparently from this year on, the Council will follow its longstanding requirement that a publication needs to have 50% paid circulation to qualify. The so-called "Lola" provisions, which were instituted in 2002, named after a now defunct Toronto art magazine, allowed eligibility if a magazine "maintain(s) at least a 25 per cent ratio of revenues from paid circulation or advertising"; the principle being that advertisers would not support a magazine that was not read. It's not known how many publications are affected by the change in the guidelines, which applies to 2010 applications that are due on March 1. The change has been reported in a posting on the website of a magazine affected, La Scena Musicale in Montreal. Publisher and editor Wah Keung Chan said that the reversion to the previous 50% paid rule was a step backward, particularly as the Ontario Arts Council had revised its eligibility criteria last year to allow -- for the first time -- controlled circulation arts magazines and journals to qualify. The OAC criteria put a cap on circulation (30,000 copies) and the publication may carry no more than 40% advertising. For La Scena Musicale, the issue is a matter of principle and transparency. Although controlled-circulation arts magazines represent a minority, they have been innovators in outreach for the arts and should be eligible for funding. The fact that the change was made without consultation and that concerned parties were not notified indicates a lack of transparency in the process. La Scena Musicale is planning a campaign to reverse this policy change, including an online petition and a Facebook group. The change was recommended by peer juries who did not feel the provision was a good fit and felt that they did not want to frustrate applicants who had little chance of being successful. The new rule affects, at most, 1 to 3 existing clients and, in those cases the peer juries have the ability to recommend an exception be made. Rogers Communications had put its media planning and buying requirements up for review, according to a story in Marketing magazine. The review puts in play an account worth some $176 million, making it the second largest amount spent, just behind Procter & Gamble. The account has been held by MediaCom (MBS). 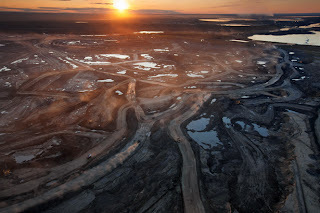 The current issue of National Geographic magazine may do more than all the thundering protests from environmentalists to put a stake through the heart of the Alberta oilsands. According to a column by National Post columnist Don Martin in the Vancouver Sun, the lavishly illustrated article is a public relations disaster. This photo shoot for the magazine's influential global audience is described as the "baby-seal moment" for Alberta's oilsands, a public relations hell equal to a seal pup's skull-clubbing death that no amount of damage control can overcome, no matter how reasoned the argument. Alberta's man in Washington, D.C., received an advance copy of the article earlier this month. He rushed it to Premier Ed Stelmach's office. The government spin doctors in Edmonton searched the 24-page spread, entitled "Scraping Bottom," for a glimmer of positive coverage, but the only rainbows they found were caused by oil slicks. 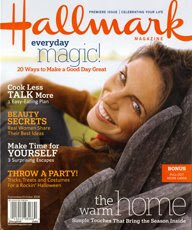 [This post has been updated] Hallmark Cards is shutting down its 3-year-old Hallmark Magazine and associated website, according to a posting on MediaDaily News. The magazines launched in the fall of 2006 and by the current February/March issue (which will be its last) had grown circulation to 800,000. It had seen advertising increase by 30% in 2008 over 2007. However, despite this, Donald J. Hall, the Hallmark CEO said the company "cannot justify continued investment in the magazine at a time when we must focus our efforts and resources only on those projects that will lead to long-term profitable revenue growth." Does geography matter. You bet. But there has rarely been a case like ReadyMade magazine, a San Franciso independent much beloved of its audience, acquired in mid-2006 by giant Meredith Corp. (Better Homes & Gardens etc.). As part of its plan to cut and consolidate staffs, Meredith (which suffered a 50% profit decline in the first six months of its fiscal year) ordered ReadyMade -- a title with a decidedly west coast sensibility -- to move to the high corn of Des Moines, Iowa, Meredith's headquarters. According to a story in SF Gate, a site operated by the San Francisco Chronicle, all the half-dozen staff member, including the founders, Shoshana Berger and Grace Hawthorne (shown), quit rather than move. "The top 13 warning signs that a magazine is in trouble", published by blogger Michelle Rafter (Word Count -- freelancing in the digital age) are pretty close to the bone. I'll bet the list, which is richocheting around the blogosphere, makes a lot of freelancers pay attention to little signs they might otherwise have overlooked. Or, for that matter, some staffers might look out for these signs, too. I would add #14: The magazine has had two publishers in 7 months. 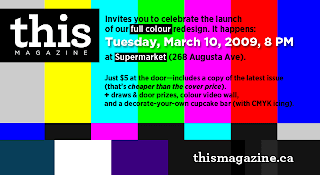 After thinking about it for more than 40 years, This Magazine is taking the plunge into full colour in its March/April issue, with a "reboot" party on Tuesday, March 10 at 8 p.m. The party has all the usual attributes, plus a decorate-your-own-cupcake bar with CMYK icing to mark the occasion. It's at the Supermarket, 268 Augusta Avenue. The Writers' Union of Canada has marked Freedom to Read Week by honouring the woman who was largely responsible for the annual week's success. The Freedom to Read Award goes to the late Nancy Fleming, former executive director of the Book and Periodical Council of Canada. She helped launch Freedom to Read Week in 1984. Since then, a yearly catalogue has been published of challenges to free expression in Canada, including the fatwa issued by the Iranian Ayatollah Khomeini against author Salman Rushdie for his book The Satanic Verses. More recently, the Writers' Union said in a release, book challenges have included the multiple charges brought against Stephen Williams and his wife Marsha Boulton, following the publication Williams’ book on Karla Homolka (all but one of the charges were later dropped), and the efforts by the Canadian Jewish Congress to remove a child’s book, Three Wishes, from an Ontario school book award reading list. The award is to be presented at a special Freedom to Read Week event on February 25 at Toronto’s Gladstone Hotel. The evening will feature interviews with previous award winners, journalist Derek Finkle, and Janine Fuller, owner of Vancouver’s Little Sister’s bookstore, noted for its long-standing dispute with Canada Customs over that agency’s frequent seizures of books destined for gay bookstores.The Writers' Union of Canada is our country's national organization representing professional authors of books. Founded in 1973, the Union is dedicated to fostering writing in Canada, and promoting the rights, freedoms, and economic well being of all writers. A "self-immolating print media has taken to reporting on itself in doomsday terms", says Cathie Black, president of Hearst Magazines. But the American magazine is not an endangered species, she writes in an AdAge article. Magazine readership was up 14% last year, she points out (while TV and newspaper lost viewers and readers). The number of magazines that suspended in 2008 was a "minuscule" 32 out of 19,500 titles published in the U.S. Single copy sales are down, but largely due to people not going to the store so often, where magazines are impulse purchases. As someone who's been in this business through several of these cycles, I vividly recall how each downturn was the worst ever and how recovery invariably required a miracle. In fact, the next downturn is always the worst, and some of the recoveries have been spectacular. Let's just hope the failure-obsessed media coverage occasionally devotes a paragraph to the magazines that are smartly changing their business without violating their first commitment to readers who, month after month, can't seem to do without them. A media blogger in New Delhi, India has compiled an interesting list of 14 possible business models to apply to the news business. Some ideas on the list, such as a consortia of newspapers collaborating with Google, seem non-starters to me. But others are intriguing and already work well (for instance the Guardian's trust model). A friend sends us this sign of the times from just over the border in the U.S., reflecting the chaotic conditions in single copy distribution there (see earlier posts). The separate MPA-associated U.S. National Magazine Awards are expected to go ahead as planned. Hard times are a challenge for art directors -- a design challenge. 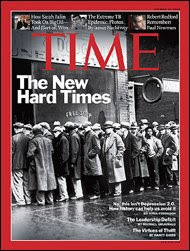 Freakonomics blogger Annika Mengizen at the New York Times ponders what makes a good, or bad, recession cover. Clichés abound, of course. 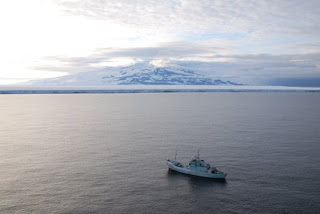 This Magazine has been running an extraordinary series of dispatches on its blog, transmitted from the Sea Shepherd, the anti-whaling vessel confronting the Japanese whaling fleet in Antarctic waters. Emily Hunter, who will be writing an article for the May-June issue of This, has vividly described the drama of the chase, including a collision with a whaler and being hunted by a Japanese ship intent on boarding the environmentalists' boat and destroying the photographic evidence they'd collected. The battle this year is over, but the war continues [writes Hunter]. Its a war for the whales, but its also for a larger ecology. This is a war because the political conflict over whaling has spurred dangerous confrontations this year, the most dangerous in the history of this conflict. Read the entire "Polarized" series . 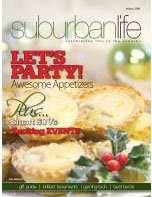 Suburban Life, a lifestyle title launched less than a year ago (April 2008) aimed at readers in the sprawl that surrounds the Golden Horseshoe, has been shut down by the Metroland Media Group, according to a report in Masthead. It went to 210,000 homes, tucked inside or polybagged as an outsert with Metroland's stable of community papers. In the wake of reports that Hachette Filippachi (Elle, Car & Driver etc. ), American Media (National Enquirer, Star, Shape, Men's Fitness etc.) and New York magazine have quit the Magazine Publishers of America, the leading magazine association in the U.S., comes word via Gawker, the Manhattan media blog, that Nina Link, the president of the MPA makes $740,000 a year. A story in the New York Observer said that membership in the MPA cost Hachette and American Media between $300,000 and $400,000 each a year. Western Living magazine has put out a call for nominations for the 2nd annual western Canadian designers of the year award. The awards program covers interiors, fashion, architecture, green, furniture, industrial and landscape. Deadline for entries is April 13. Celebrity judges include Karim Rashid, Kelly Deck, Robert Ledingham, John Fluevog, Patricia Patkau and Bing Thom. Winners will be published in the September 2009 issue of Western Living. Anderson's shutdown meant that as trucks arrived at 11 Anderson-owned Prologix East locations between February 6 and February 9, they found them closed. Trucks had to be re-routed back to QW plants. The News Group, which co-owns Prologix with Anderson, re-opened the Prologix East facilities on February 11. After Anderson shut down and national distributors had reassigned almost all of the Anderson News and Source Interlink copies to new wholesalers, a court order prohibited publishers and national distributors from denying shipments to Source Interlink's wholesale magazine distribution business. Copies had to be re-consigned—again—resulting in a deluge of shipping requests and changes that created havoc. Under the new, multi-year agreement, Time Inc. will not have to pay the per-copy fees. A new, quarterly magazine is being launched this spring in Calgary that will celebrate graphic design, typography and, among other things, "great ideas and strange inventions". It's called UPPERCASE, a magazine for the creative and curious and it's published by UPPERCASE gallery owner Janine Vangool, collaborating with writer, curator and teacher Deidre Martin. 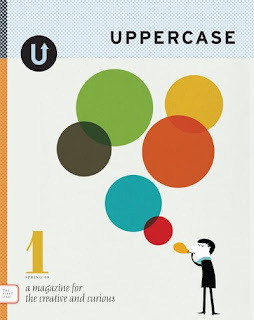 UPPERCASE Gallery opened in February 2005, specializing in "making, curating and publishing visual culture" and has branched out into publishing the magazine and specialty books, marketing them through its online store and on-site shop. This magazine is a labour of love, and our hope is to make it a sustainable endeavor. The magazine will not be available on newsstands, but via UPPERCASE and a small network of like-minded shops and booksellers. Your subscription is a vote of confidence, a pat on the back and a high-five rolled into one. Our goal is to gather a few hundred loyal subscribers over the next couple months and to continue to grow our readership slowly and steadily over the next year. UPPERCASE is thinking small in order to think big. 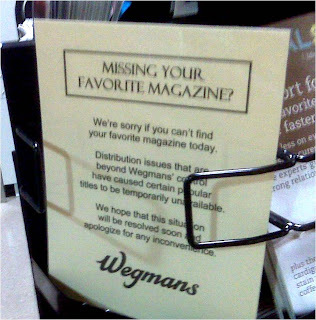 We don't need to be in newsstands everywhere, we just need to be accessible to the people who want us. 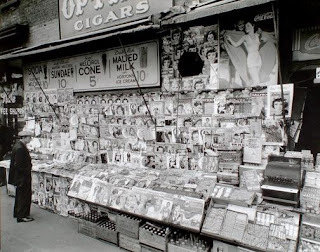 Traditional magazine distribution encourages overproduction, resulting in wasted resources and pulped magazines. CLB Media is discontinuing the publication of Associates, a spinoff from flagship title Canadian Lawyer. The law and lifestyle title was designed for young lawyers and started publishing in February 2008. A preview issue had been rushed out in November 2007 as as a competitive response to the launch of Precedent: the new rules of law and style, an independent quarterly magazine aimed at...young lawyers. 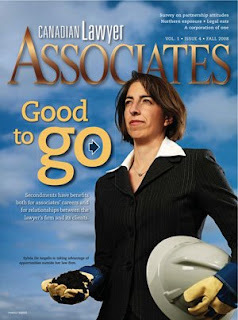 A letter to current and recent advertisers says the spring 2009 issue will be Associates' last, citing a lack of sufficient advertising support. The most recent issue on its website is the dated Fall 2008. Meanwhile, Precedent, which is edited and published by lawyer Melissa Kluger, continues to publish. 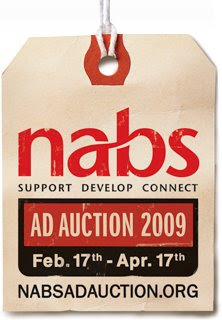 The National Advertising Benevolent Society (NABS) is holding its 18th annual ad auction in support of its programs. NABS provides free support, financial, career and counselling assistance to all individuals who have spent the majority of their career working with communications organizations, and who are involved in the creation, production and placement of advertising; this includes many people working in magazines. There are more than 250 donated national, regional and local media packages, with face value of more than $3 million up for bids, often at discounts of 50 - 60% off the net rate card value. Prices range from $500 to as much as $80,000. Registration is free, and anyone can bid for media online, including not-for-profit and charitable organizations. Packages are available for up to 12 months (May 2009 to April 2010) and buyers don't have to pay until they use their packages. The two-months auction is online until April 17. One of the valuable things lost in the headlong corporate consolidation that characterizes Quebecor Media is the hometown and local character of its newspapers. This is no better illustrated than by the decision to merge three, venerable local papers in eastern Ontario, formerly part of the Osprey Media chain, into one. According to a post on a Sun-expat website, the Cobourg Daily Star, founded as a weekly in 1831; Port Hope Evening Guide, founded in 1878 and Colborne Chronicle, founded in 1959 from the ashes of the Colborne Express, 1866, and the Colborne Enterprise, 1886 have now been replaced by Northumberland Today. To add insult to injury, the 16-page daily now costs $1.25, up from the $1 Cobourg and Port Hope readers were paying. [This post has been updated] Larger titles may take a hit if ultimately the new Canada Periodical Fund (CPF) announced Tuesday holds to a $1.5 million cap on funding. That would halve the money available to some larger magazines. Missed in the early discussion (including on this blog), however, was the possible impact on smaller titles of a circulation minimum. In addition to a ceiling, there is a suggested annual floor of 5,000 total circulation (subs and single copies). If that were to prevail, it would make ineligible a good many some of Canada's smaller arts, cultural and literary titles. Many such have annual press runs that are much less than 5,000, let alone paid circulated copies. [UPDATE] With the 5,000 annual floor, a quarterly with 1,250 per-issue paid circulation (copies reaching the end user) would qualify. But a quarterly with a paid circulation per-issue of 1,000 would not. [UPDATE] The floor only applies to the main editorial granting program; the smaller project grant portion has no such restriction. Sources at Magazines Canada however say that the details have yet to be worked out and that they will be lobbying hard to get smaller arts and literary magazines looked after in the detailed regulations of the program. Transcontinental is closing Canadian Home & Country magazine as part of a company-wide "rationalization" that will mean that 1,500 jobs are being eliminated across North America, saving the company some $50 million this year. According to a posting in Mastheadonline, 28 magazine jobs are being eliminated in Toronto. A company press release says that a company-wide hiring freeze has been instituted and that further unpaid leaves, reduced work weeks and other measures are being implemented. Transcon is Canada's largest consumer magazine publisher and one of North America's largest printers and publishers of community newspapers. In 2008, the company had sales of $2.4 billion. According to a report on Bloomberg.com, the cutbacks were largely driven when customers canceled or delayed direct-mail projects and magazine advertising. The story noted that immediately after the cutback announcement was made, Transcontinental fell 30 cents, or 3.3 percent, to C$8.69 at 11:51 a.m. in trading on the Toronto Stock Exchange; shares have dropped 43 percent this year through yesterday. The Supreme Court of Canada has reserved judgement, as it was expected to do, in an important appeal that has broad implications for investigative and hard-hitting journalism in Canada. The appeal involves a $125,000 libel judgement against the Ottawa Citizen. The appeal hinges on whether journalists can defeat libel claims even if some of their facts turn out to be unproven, as long as they acted fairly and in the public interest. This is a standard that is upheld elsewhere in the world and media lawyers for many of Canada's largest newspaper publishers argued it should be Canada's standard, too. 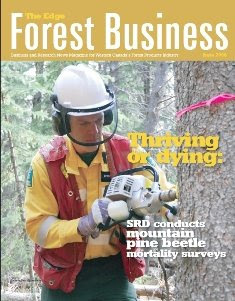 The Edge Forest Business Magazine is folding, after 17 years covering Western Canada’s forest products industry. According to a story in the Edmonton Journal, the reason is the same economic woes that closed mills. Forest-industry suppliers were its main advertisers and they had cut back. Published nine times a year, the Edmonton-based magazine (June issue shown) had three staff, who have been laid off. Holehouse held out some hope for the magazine to come back in some online form. Advertising revenue in Rogers Publishing magazines and newspapers were flat during the last quarter, according to a Rogers executive, according to a Financial Post story. Rogers Media president Tony Viner [told an analysts' conference call today] the picture for media advertising spending that "so far things aren't getting better in 2009," and are unlikely to improve before the end of the year. He said about 50% of revenues in the company's media business come from advertising, which is lower than other Canadian media companies. Rogers Communications Inc. reported a loss of $138 million or 22 cents a share in the last quarter ending December 31, compared with the same quarter a year earlier. A good deal of this was due to $294 million in writedowns in its television holdings. However the company is to buy back $300 million in shares and raised its annual dividend to $1.16 or about 29 cents a quater. Overall revenue from both business units climbed 9.4% to $2.94-billion ($1.65 billion of which was in the company's mobile phone business, which saw a modest increase in the average per-user revenue to almost $75.) Operating revenue at the company's television and cable internet business also rose 6.7% to $985-million. Why all the fuss about brands and user-creator relationships and, ultimately, trust? Simply put, trust is an economic good. It’s worth something. It makes markets work more efficiently. As a trader might say, trust is positively accretive to value. This is not just about peace, love, and harmony. Trust creates value. Value gets monetized. Money pays journalists. Journalists save the world. -- Josh Young of Network(ed) News writing about the relationship between users and creators. Readers? What do they know? The New York Post reports that, a month after Condé Nast announced it was foldingDomino magazine, more than seven fan sites of the chic home-design magazine have sprung up, including a Facebook bereavement page. Many fans wonder why Si Newhouse shuttered Domino, which despite seeing ad sales decline had rising newsstand and subscription numbers. We doubt that if Newhouse pulled the plug on one of his other foundering books - like, say, Portfolio - such an outpouring of grief would occur. The new Canada Periodical Fund is expected to deliver about $75.5 million in funding support for the magazine industry. The CPF -- which will merge the Publications Assistance Program and the Canada Magazine Fund starting in 2010 -- has essentially preserved the level of funding previously received. The announcement was made this morning in Montreal. This can be considered a major accomplishment for James Moore, the minister of Canadian Heritage as he contends with straitened budget circumstances in Ottawa. It's also a lobbying coup for Magazines Canada. The new program -- whose details will be worked out in industry consultations over the next year -- will probably cap grants to any one title at a level of $1.5 million, although it won't necessarily limit what can be given to a multi-title publishing company. The program won't necessarily start in April 2010, either; its implementation depends very much on having a smooth transition, according to industry sources. In the interim, current programs (PAP and CMF) remain in place. Eligibility will require fundable magazines to have some combination of verified paid or request or newsstand circulation, as well as containing a minimum of 80% Canadian content. There was no announced separate fund for community newspapers and the farm press, who had been pressing for it, so they will continue to be competing with consumer and b2b magazines in the main fund. While there is a lot of talk about online and digital publishing initiatives, this will depend on definitions derived from a consultation that hasn't yet been done. The bulk of the money ($72 million) goes to publishers to spend as they wish on any aspect of building their businesses. In addition, there is about $2 million for "collective initiatives"; this replaces the association infrastructure program which was formerly about $2.5 million. And there is a $1.5 million for business innovation -- project support for small enterprises. Small literary and cultural magazines come under the main funding umbrella; the current SALM (support for literary and arts magazines) program will be discontinued and it remains to be seen what proportion of the main fund will be informally allocated to small cultural titles. Professional association magazines such as those for accountants, engineers and so on will no longer be eligible. [This post has been updated]Facebook pages continue to be very popular ways for writers and photographers and magazines to promote themselves, but they may now have second thoughts. An article from the internet advertising and media site Adotas says that the terms of service have been subtly changed so that your old content, including pictures, may not only become Facebook's property, but that it can repurpose the material and resell it. Previously, the contract language said -- and users believed -- that, if you closed your account, your content was removed. [This post has been updated] The March issue of Canadian House and Home contains an example of uncomfortably close alignment between editorial content and advertising. A regular makeover features a spread about a kitchen, one in which muddy footprints are tracked across the floor. The next spread shows virtually the same right hand page with the footprints cleaned up, a Swiffer mop leaning against the counter and a copy line "Swiffer gives cleaning a whole new meaning". This treatment would seem to contravene several provisions of the Canadian magazine advertising-editorial guidelines. An advertiser's name or logo may not be used to suggest advertising sponsorship of any regularly appearing editorial. Any advertisement that contains text or design elements that have an editorial appearance must be conspicuously identified with the word "advertising'’ or "advertisement." We are proud of the creativity and partnership we have with Starcom and Procter & Gamble's Swiffer and Febreze in our March Issue. In large part it is our key advertisers to thank in this market for our continuing ability to affordably deliver great decorating content to our Canadian subscribers and newsstand purchasers. Marketing magazine reported that the ad was a collaboration between the magazine and the advertising agency. The ad is the result of extensive collaboration between House & Home Media, parent company of Canadian House & Home, and Starcom. 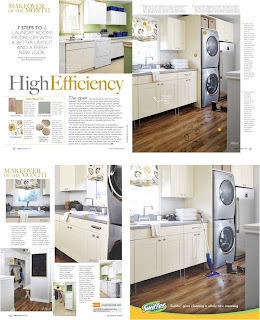 Both the advertising and editorial components were photographed by Canadian House & Home’s editorial team. In November, Transcontinental's Style at Home ( a House & Home competitor) made a similar arrangement with the same advertising agency in which a stitched in acetate overlay allowed a coffee machine to be placed on the counter of one of its kitchen editorial pages. The much-anticipated merger of the Publications Assistance Program (PAP) and the Canadian Magazine Fund (CMF) will be unveiled on Tuesday by Minister of Canadian Heritage James Moore. Word is that invitations have gone out to key players in the industry so they can be in Ottawa Montreal for the announcement. The new program is expected to be launched starting April 1, 2010. The anticipation of the new CPF hasn't been eager, mind you, since many publishers fear that the merged program may be somewhat less than the sum of its parts.) There has been vigorous lobbying by industry associations to ensure that the PAP in particular will be preserved. That seems to be assured, at least in the short term. There is concern in some quarters that the program will be diluted by granting the same amount of money to a wider pool of applicants (it already goes to magazines and community newspapers). And Heritage has already put out a request for proposal for consulting on giving support to digital magazines and newspapers. The recent budget replaced $15 million that was being withdrawn from PAP by Canada Post, but there was no suggestion of increased funding over all. Coming up with and using a "wheat sheet" made of leftovers from grain harvesting won Markets Initiative and Dollco Printing the Most Progressive Environmental Printing project award yesterday at the annual Print Action Environmental Printing Awards. Nicole Rycroft, executive director Markets Initiative, was also recognized, for the second time, as an "environmental innovator". The ‘wheat sheet’ was used in Canadian Geographic’s June 2008 issue, the first time wheat straw waste was used in North American publishing. Last week, public documents showed that Ann Dowsett Johnston, a former editor at Maclean’s magazine who took the post of vice-principal, development, alumni and university relations, in February, 2006, and departed 19 months later, was paid $439,788 in wages and benefits while there and $321,471.95 when she left. She had been hired to lead the university’s major fundraising campaign, with a goal of raising $750-million by 2012, but left two months before its launch. A McGill spokesman declined to tell us why Ms. Dowsett Johnston left, citing confidentiality. But the corporate-style compensation package has surprised those in academic circles and been the talk of Montreal dinner parties. KMI Publishing and Events, a Toronto-based branch of an Australasian company, has launched a new bi-monthly business-to-business magazine called Liquor Canada, serving Canada's more than 20,000 liquor-serving licensees. The magazine is sold by subscription and by single copy; cover price is $6.99 and a 12-issue sub is $39. A full page ad, 1x costs $4,500. A leaderborad web ad is $2,500 a month. Circulation is 39% in Ontario, 23% in British Columbia and 18% in Alberta. The company also publishes Canadian Real Estate and Canadian Mortgage Professional magazines. KMI is part of Key Media,a publishing and events company, which has offices in Sydney, Australia, Hong Kong and Singapore. a publisher of specialist industry news magazines, including Asian Legal Business China, Asian Legal Business Hong Kong, Asian Legal Business Singapore, Asian Legal Business China, Asian Legal Business, Australian Broker, Australasian Legal Business, HRM Singapore, Human Capital Australia, Mortgage Professional Australia, MPA Lender, Your Investment Property and Your Mortgage. 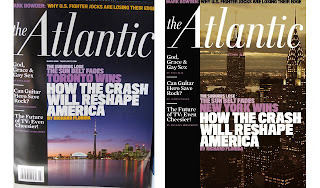 Just when you'd think that magazine publishers would ramp up their cooperation and pull together in the face of hard times, the decision by Hachette Filippachi (publishers of Elle and Car & Driver among others) to pull out of the Magazine Publishers of America (MPA) has caused talk. Tony Silber at Folio: predicted that Hachette would not be the last big publisher to become a dropout. The reason, according to AdAge, may have been to save the dues money, with Hachette deciding the annual cost wasn't commensurate with the annual benefits, though there may be more to it. Jeff Bercovici of Portfolio reported that Hachette was saving $1 million a year. He also published a back-of-the-envelope calculation that Time Inc. pays nearly $3.25 million, Condé Nast (which publishes Portfolio) $2.75 million and Hearst $2 million. The MPA responded that dues are based on circulation and ad revenues and that the numbers cited were "highly overstated". There is no indication that similar defections are being seen in Canada at the MPA's counterpart, Magazines Canada. Large publishers tend to see having a national lobbying organization to speak with one voice on postal and funding issues as a vital cost of doing business; smaller members agree, but tend to find that the services such as MagsCan's distribution business, make membership worth the price. RedPoint Media Group is closing its title CalgaryInc. Its final issue will be published in March. Five employees and one intern have been laid off. Executive vice-president Gary Davies told CBC News on Thursday that some elements of the magazine, such as "Top 40 under 40" will be rolled into Avenue, another Redpoint magazine. Davies blamed the layoffs on falling advertising sales since Sept. 1. What's behind the abrupt departure of Bob White at ABC Canada? 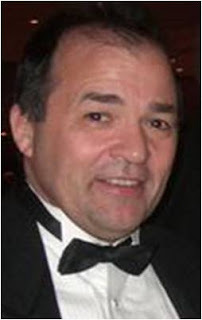 The abrupt departure of Bob White, senior vice president of Canada after 15 years at the Audit Bureau of Circulations (ABC) in Toronto raises a good many questions. Anyone know what's going on there? A judge in New York has issued a temporary restraining order, forbidding magazine publishers from diverting their titles from Source Interlink's distribution stream. The order, as reported in Folio:, is related to Source's dubious contention that big publishers are colluding to put it out of the single copy distribution business. When, in fact, what may put it out of the distribution business is a) the badly broken single copy business model and b) Source's own decision to high-handedly try to impose a surcharge on publishers without discussion. Named in the suit are Time Inc. and Hachette, American Media Inc., Bauer Publishing, Curtis Circulation, Distribution Services Inc., Kable Distribution Services, and Time Warner Retail. Those were the days...weren't they? 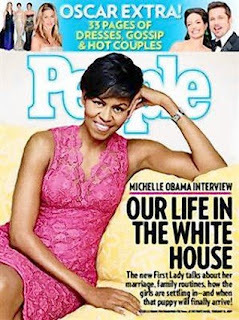 It was probably inevitable that Michelle Obama would wind up on the cover of Vogue, given that people are as interested in her wardrobe as her intellect. What is unusual, apparently, is that she is considered to have enough taste that the editors allowed her to choose her own outfits, according to a Canadian Press story. Her cover shot in the March issue was done by megastar photographer Annie Liebowitz. 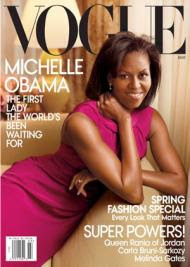 For Obama, Vogue editors broke with tradition and allowed her to choose her own outfits for the March issue, including the magenta gown she wears on the cover that's the creation of one-time Vancouver resident Jason Wu. "She doesn't need any help. She loves fashion and knows what works for her," said Andre Leon Talley, Vogue's editor-at-large. "She's never had a conversation with me about, 'What do you think?' or 'How did this look?' And I'm glad for that." A trade magazine serving the beleagured Quebec paper industry has been shut down. According to a post in Mastheadonline, the Business Information Group, Canada’s largest b-to-b publisher, has closed Les Papetières du Québec, which was founded in 1990, and had a circulation around 4,400. Canadian Press has made an online version of its venerable and highly respected Style Guide and Caps and Spelling, for a fee. So, apparently, the premium for searchability is $20 the first year and thereafter $75. Or am I missing something? Michael Cooke, a peripatetic former colleague of Toronto Star publisher John Cruickshank at the Chicago Sun-Times (once owned by Conrad Black) has been appointed as editor of the Toronto Star, Canada's largest daily newspaper. Currently editor-in-chief of the Sun-Times, he has also served as vice-president of editorial for the Chicago Sun-Times News Group, overseeing more than 100 titles and editions. He got into the newspaper business in Britain and after emigrating, has been variously editor-in-chief of the New York Daily News and worked at the Vancouver Province, at the Star, the Edmonton Journal and the Montreal Gazette. As expected, the United States Postal Service (USPS) has announced rate increase for periodicals of 4% -- actually 3.976% -- starting May 11. According to a report in Folio:, while the rate is tied to the consumer price index, currently 3.8%, USPS is charging slightly more because it didn't use all of its allowable rate increase in 2008. [This post has been updated] The Ontario Human Rights Commission is calling for a consolidated, national press council that would have the power to hold Canadian magazines, newspapers and internet sources to book for professional standards and accountability. According to a story from the National Post, carried by CanWest News Services, the council should have the power to order publications and websites to publish its decisions. Barbara Hall [a former mayor of Toronto], OHRC chief commissioner, said in an interview that the rise of the internet has strengthened the case for a national media watchdog. In her vision, a national press council would be "a vehicle for full discussion about what’s written in the media" that is less strict and more accessible than the courts. The recommendation is part of the OHRC's contribution to a wide-ranging review by the Canadian Human Rights Commission, which is preparing a report to Parliament about the future of human rights regulation. It's also in response to recent cases -- such as a number of complaints in different jurisdictions against Maclean's magazine. Hall’s endorsement is the most prominent so far, and it marks a significant moment in the debate over the role of human rights commissions in regulating the media. Hall was widely criticized for voicing her sympathies with the Maclean’s complaint, even while formally rejecting it. A national press council could alleviate this confusion by providing a forum for complainants who turn to human rights commissions, perhaps wrongly, as a last resort. "As we saw in the Maclean’s case, we had different responses from each province, and that’s really confusing for people," Hall said. However, the president of the Canadian Association of Journalists, Mary Agnes Welch, said she felt the idea of a national press council was a practical impossibility. "The provincial ones don’t even work so how could we have a national one?" she said. "And I know a lot of journalists who would take umbrage at essentially being in a federally regulated profession . . . If on the crazy off-chance that there is some momentum behind this idea of a national press council, it won’t be coming from journalists."